Synopsis: Townsend Harris is sent by President Pierce to Japan to serve as the first U.S. Consul-General to that country. 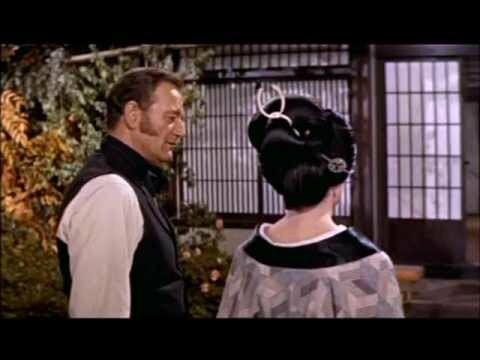 Apparently the set of The Barbarian and the Geisha was not a happy one. Director John Huston and his leading man, John Wayne, didn’t see eye to eye, and rumour has it that Wayne even attempted throttling the director at one point. Perhaps unsurprisingly in the light of such revelations, this was to be their only movie together. Once Huston had completed principal photography he had pretty much nothing more to do with its production, but was enraged enough by the way in which the studio chose to edit it to virtually disown the movie. It would be interesting to see how he would have changed things, but he was right to be disappointed with the finished product. The Barbarian and the Geisha is a turgid melodrama, and watching it is a little like sitting through double history with a particularly uninspiring teacher. The story is based on truth. American diplomat Townsend Harris, the character played by Wayne, was sent to Japan by U.S. President Franklin Pierce to become the country’s first Consul General to the previously closed country. Although there’s no evidence to support the claim, it’s rumoured that while there he had an affair with a 17-year-old Geisha girl named Okichi (played in the movie by Eiko Ando). Either way, the movie is pretty coy about coming right out and showing us the pair of them locking lips or even declaring their love for one another, even though it’s fairly clear from the things they do for one another that they’re more than just good mates. The film opens with Harris’s arrival in Japan, accompanied by European interpreter Henry Heusken (Sam Jaffe). The Westerners are met with hostility from the locals, and shown only cursory courtesy from Governor Tamura (So Yamamura), and are housed in a rundown building by the ocean. Because Harris refuses to deliver his President’s letter to anyone but the Shogun, he and Heusken are pretty much left kicking their heels for months on end, receiving visits from the Governor or one of his men only when they do something to displease him, such as raising the American flag in the garden of their modest house. Five months pass by with no progress made, until an American ship is spotted off the coastline. After preventing the Japanese from firing on the ship by standing in front of their cannon, Harris sails out to greet the ship only to discover that many of its crew are stricken with cholera. Even worse, a number of the stricken sailors jump overboard and make for the shore where they immediately infect those who help them from the water. Within days, the village — including Okichi — is in the grip of an epidemic which the Japanese are unable to fight. While they plead with ancient deities, Harris takes matters in hand by forcibly torching the town, an act for which he is roundly condemned until it becomes apparent that his actions have succeeded in halting the progress of the disease. It’s difficult to see what it was about this movie that appealed to the likes of Huston and Wayne. The story is as dry as old twigs, with very little happening before the outbreak of cholera, which doesn’t take place until we’re about an hour into the movie. You’d perhaps be forgiven for thinking that things might pick up a bit after that, but having briefly aroused itself from its stupor the movies sinks back once more into a state of ennui until the final fifteen minutes, when Harris finds himself the target of an assassination attempt. As I mentioned earlier, any romance between Harris and Okichi is glossed over to such a degree that you could be forgiven for thinking they were just good friends rather than ardent lovers. Mind you, even given Hollywood’s penchant for matching ageing leading men with much younger female co-stars back then, seeing the craggy 51-year-old Duke canoodling with a Chinese woman less than half his age would no doubt have looked just too wrong for the movie to recover from. Wayne himself never appears comfortable in the role, and never really convinces as an American diplomat versed in the manners and traditions of a foreign land. Eiko Ando looks radiant as Okichi, although she’s not really given a lot to do other than to provide a few moments of narration, which is strange in itself as her character is absent from many of the scenes that we see.